The Epson TM-U220 printer is a reliable workhorse and industry standard point of sale printer that is most often used to print orders at the bar or in the kitchen, although it can also be used to print customer receipts and control an APG standard cash drawer. The Epson TM-u220 POS printer is a dot-matrix impact printer. This printer works similar to an electric typewriter and uses replaceable ribbon cartridges. 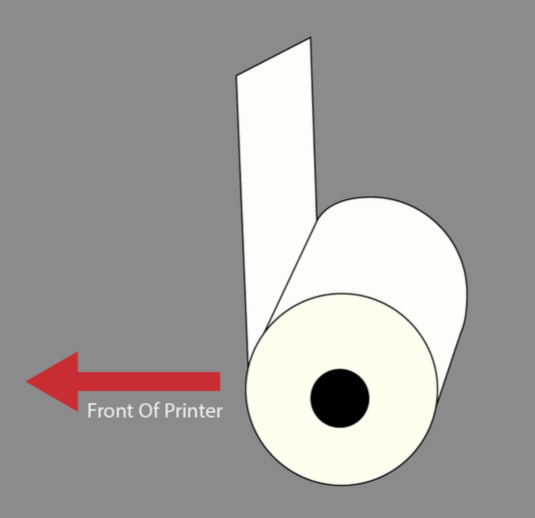 It prints on standard 3-inch wide plain paper rolls. Unlike output from thermal printers, the paper and ink are resistant to grease and heat in the kitchen and remain readable even in tough kitchen environments. One potential drawback is that compared to thermal-type printers, it takes longer to print and is louder. Use compatible plain receipt paper rolls that are 3 inches wide and no more than 230 inches long. Close the lid with 2 inches of paper sticking out. The ribbon cartridge is on a continuous loop, as it’s used the printing becomes lighter. When the output it too faded to see clearly, it’s time to replace the cartridge. Use only approved Epson ERC 30/34/38 red and black ribbon cartridges. 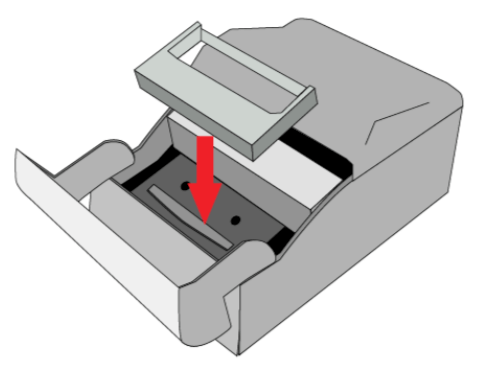 Open the front cover of the TM-u220 printer and dispose of the spent cartridge. And replace with a new cartridge as shown in the diagram. There are three LED indicator lights on the front of the printer. POWER — (Green) On when the power is on and off when the power is off. ERROR — (Red) On when the printer cover is open, when the network is offline, and when the paper is out. Flashes when a printer error occurs. PAPER OUT — (Yellow) On when the printer is nearly out of paper and when it’s out of paper. There are two buttons on the Epson u220 POS kitchen printer. 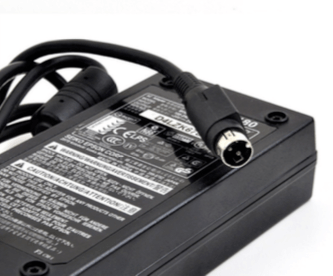 POWER — The power supply button is a rocker-type switch on the front-right side of the printer. Power is on when the rocker is switched to the “I” position and off when switched to the “O” position. FEED — The feed button is located at the front of the printer near the LED indicators. The feed button is used to manually feed paper from the printer. There are three ports on the Epson TM-u220 sold with the Rezku POS system. CASH DRAWER — Used to connect to an APG cash drawer and control the drawer-release. A/C POWER — Power connector port for approved Epson printer locking A/C power adaptor. NOTE: There are many versions of the Epson TM-u220. Rezku POS uses LAN based Epson printers and is not compatible with serial-port connected versions of the printer. The Epson TM-u220 printer comes pre-configured by Rezku with the latest compatible firmware configuration and settings for quick “plug and play” setup. A factory reset clears network settings and any advanced configuration on the printer. Tilt the printer forward, towards you to access the SW switch on the back, next to the LAN port. The status sheet will tell you information about the printer including it’s network configuration and MAC address. The printer self-test can be used to help diagnose printing issues. NOTE: After printing the self-test, the red ERROR light will flash. The printer must be turned off and back on normally before it will function. You may want to access the printer’s advanced configuration settings. These guides describe how to access the printer configuration and set up the Epson TM-u220 printer for a dynamically assigned IP address. 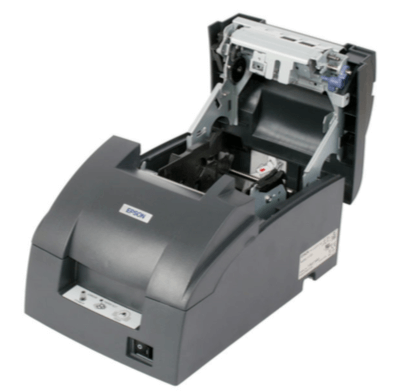 For additional help with your Epson TM-m30 Thermal POS receipt printer please contact Rezku Support. We’re always happy to help!